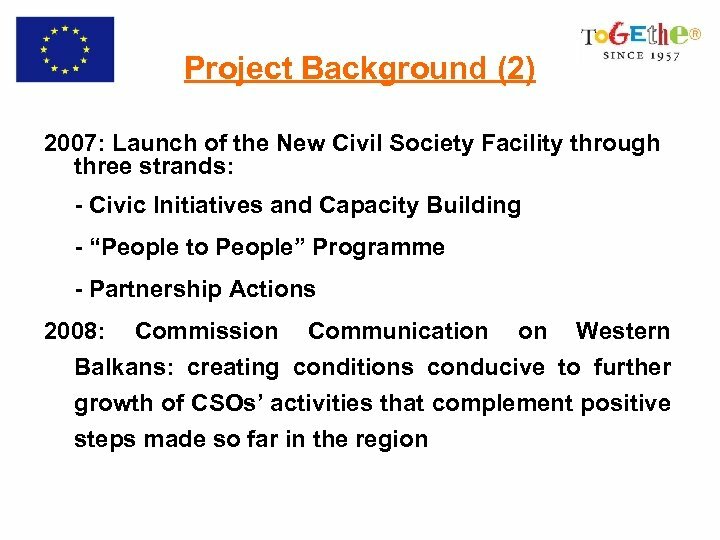 Project Background (1) § 2005/2006 Commission Communications on the “Western Balkans” and on “Civil Society Dialogue in Candidate Countries”: the importance of extended relationship between CSOs from Europe and from the region. 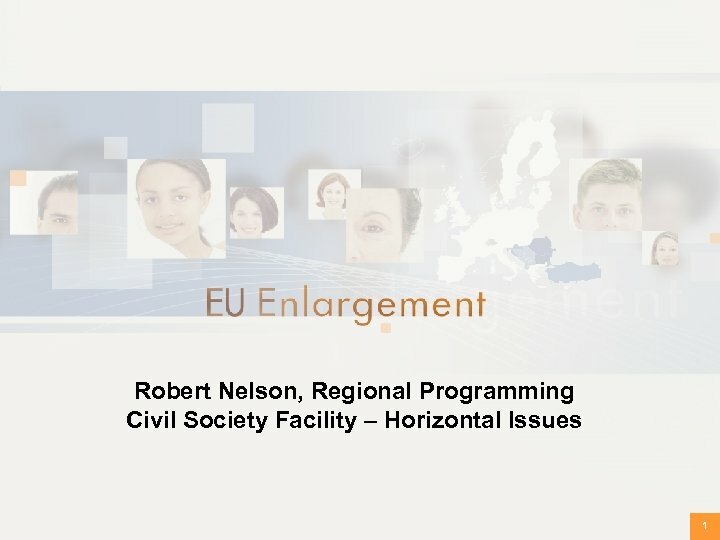 § 2007/2008 Enlargement Strategy Paper: commitments by the European Commission to improve the quality of enlargement process by emphasising fundamental issues such as civil society development and people-to-people contacts within the region and with the EU. 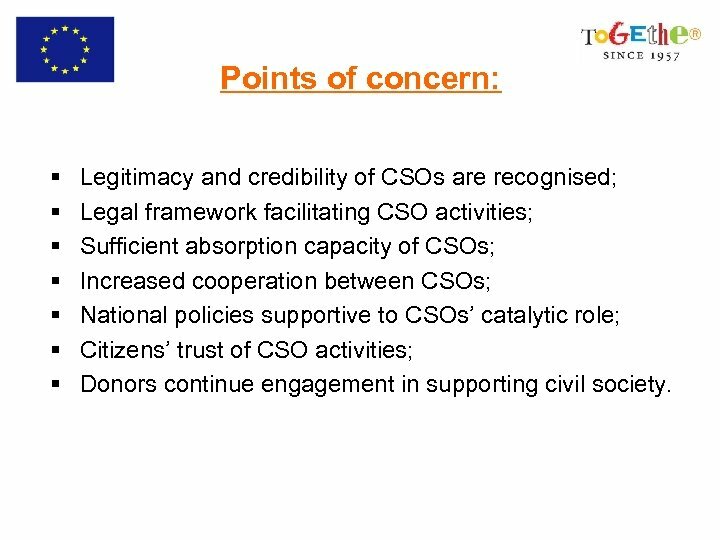 Points of concern: § § § § Legitimacy and credibility of CSOs are recognised; Legal framework facilitating CSO activities; Sufficient absorption capacity of CSOs; Increased cooperation between CSOs; National policies supportive to CSOs’ catalytic role; Citizens’ trust of CSO activities; Donors continue engagement in supporting civil society. 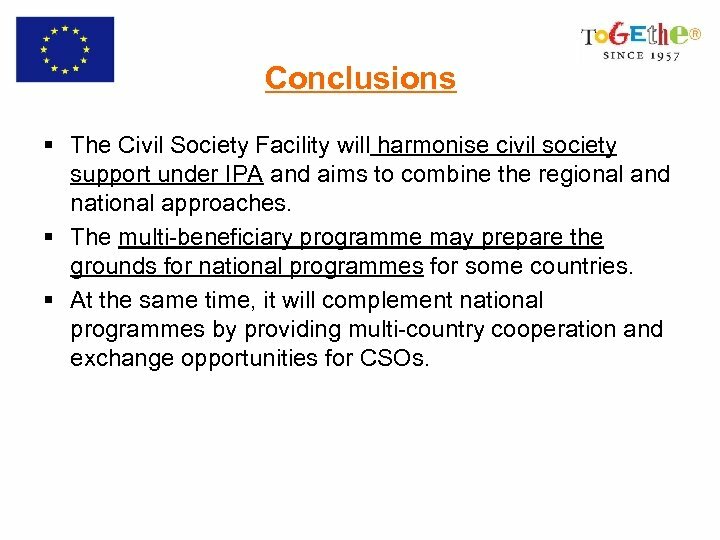 Conclusions § The Civil Society Facility will harmonise civil society support under IPA and aims to combine the regional and national approaches. § The multi-beneficiary programme may prepare the grounds for national programmes for some countries. § At the same time, it will complement national programmes by providing multi-country cooperation and exchange opportunities for CSOs. 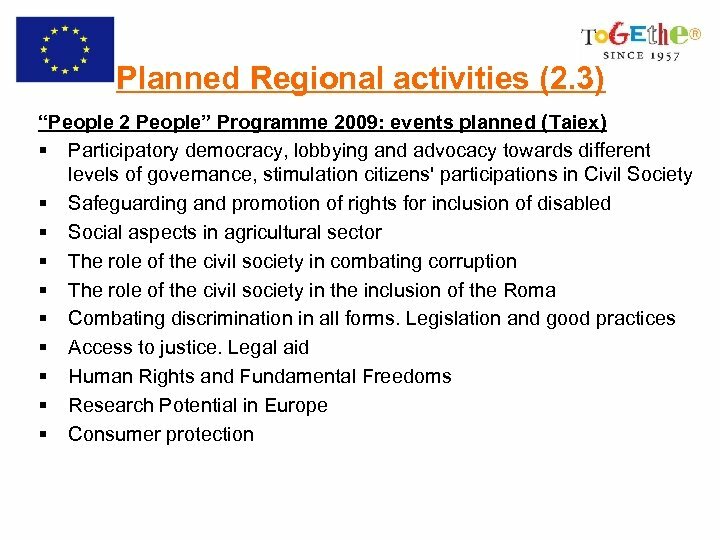 Planned National Activities in 2008 Mainly Calls for Proposals for grants to Civil Society Organisations: § Bosnia and Herzegovina € 3. 5 Million § Croatia € 3. 0 Million § the former Yugoslav Republic of Macedonia € 1. 2 Million § Serbia € 2. 0 Million § Kosovo (under UNSCR 1244) € 1. 7 Million § Turkey € 3. 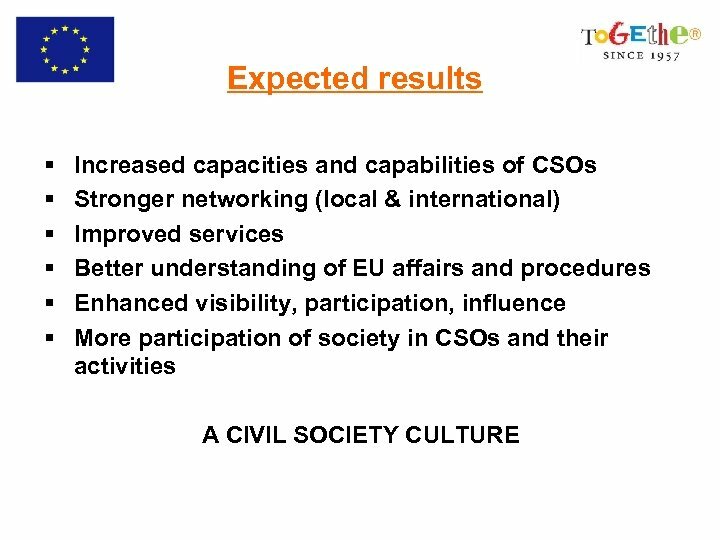 2 Million Albania and Montenegro are concentrating on existing support under CARDS and will programme new activities under the Civil Society Facility in 2009. 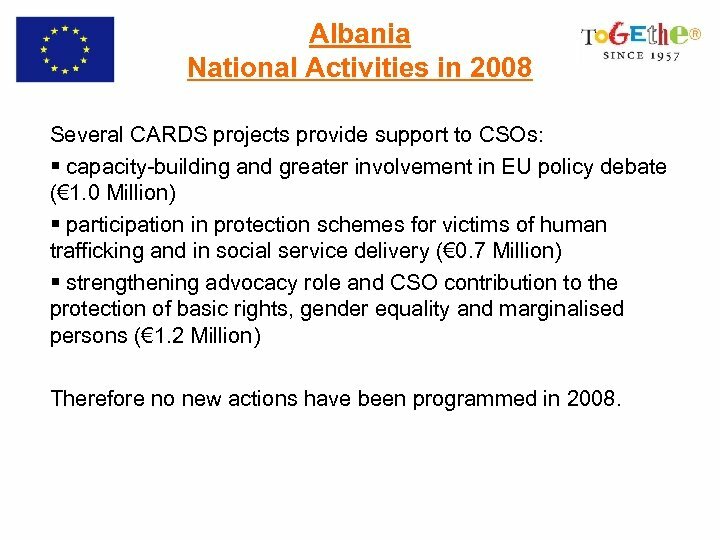 Albania National Activities in 2008 Several CARDS projects provide support to CSOs: § capacity-building and greater involvement in EU policy debate (€ 1. 0 Million) § participation in protection schemes for victims of human trafficking and in social service delivery (€ 0. 7 Million) § strengthening advocacy role and CSO contribution to the protection of basic rights, gender equality and marginalised persons (€ 1. 2 Million) Therefore no new actions have been programmed in 2008. 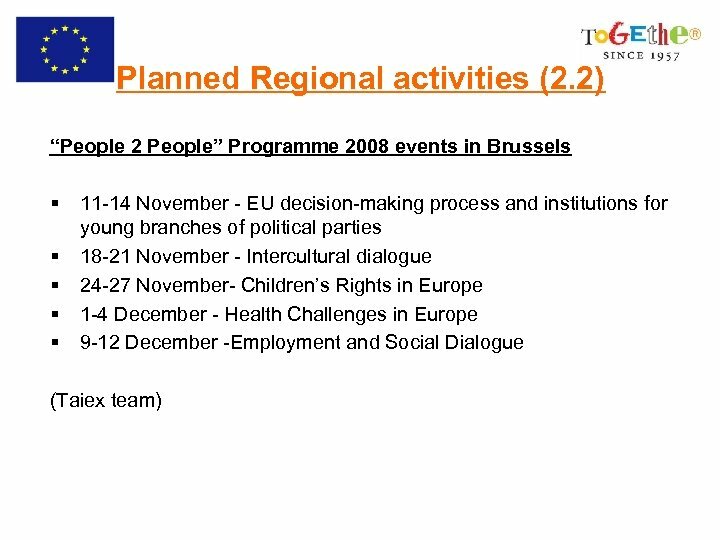 Bosnia and Herzegovina National Activities in 2008 The IPA 2008 programme (€ 3. 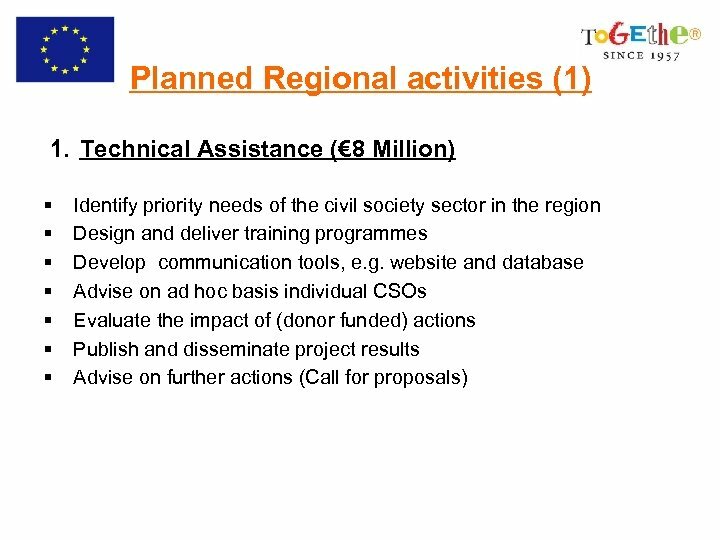 5 Million) will consist of: § Supporting the cooperation of CSOs with municipal authorities § Establishing a permanent NGO fee-based training Centre § Raising the capacity of CSOs in addressing environmental problems § Creating and implementing the National Youth Strategy It will be implemented by: § a call for proposals, § TA to provide support in fields not covered by the regional TA, § a grant agreement with UNDP. 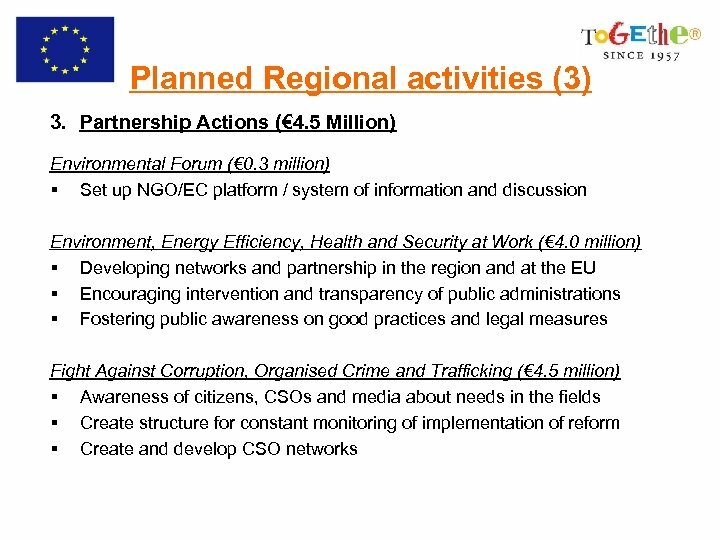 Croatia National Activities in 2008 Aim: Improving CSO capacity to monitor and implement EU acquis (transparency and accountability, the fight against corruption, anti-discrimination strategy and sustainable development) § Each grant will include capacity-building and networking encouraging contacts with EU counterparts § Implemented via 3 grant schemes (each € 1. 15 Million) § Calls for Proposals: 1 st quarter - contracts to be signed in 4 th quarter of 2009.
f. YRo. 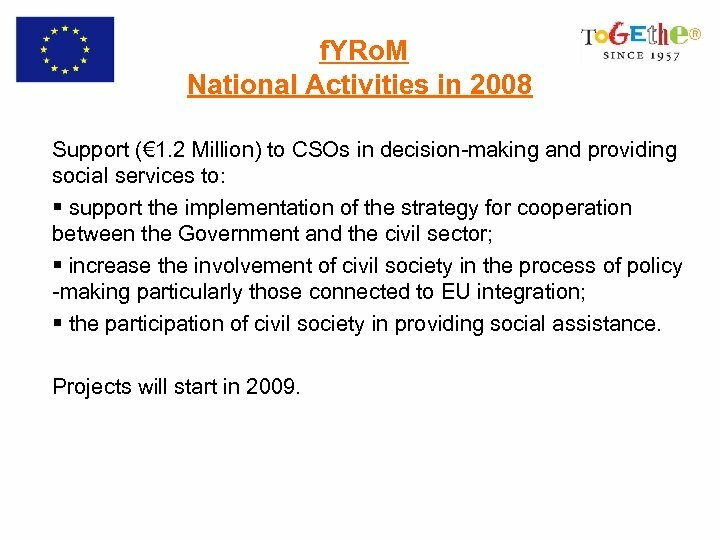 M National Activities in 2008 Support (€ 1. 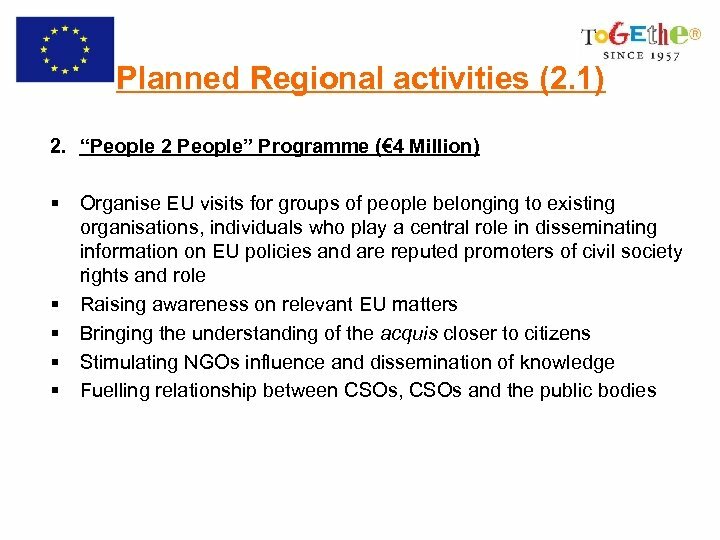 2 Million) to CSOs in decision-making and providing social services to: § support the implementation of the strategy for cooperation between the Government and the civil sector; § increase the involvement of civil society in the process of policy -making particularly those connected to EU integration; § the participation of civil society in providing social assistance. Projects will start in 2009. 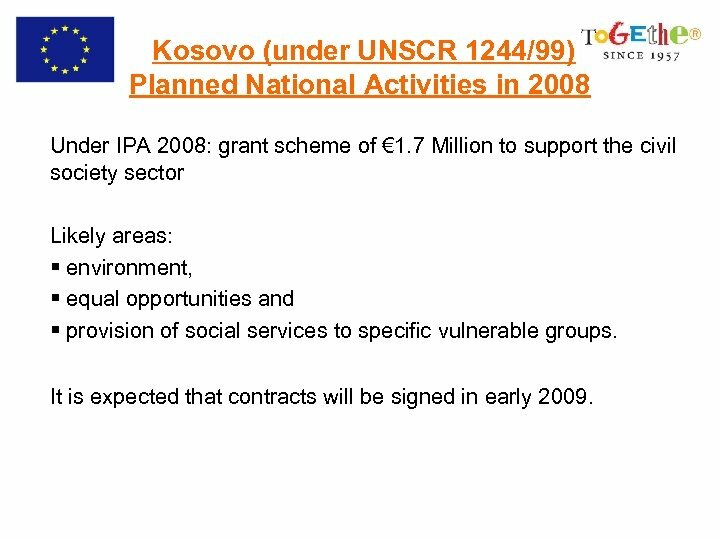 Kosovo (under UNSCR 1244/99) Planned National Activities in 2008 Under IPA 2008: grant scheme of € 1. 7 Million to support the civil society sector Likely areas: § environment, § equal opportunities and § provision of social services to specific vulnerable groups. 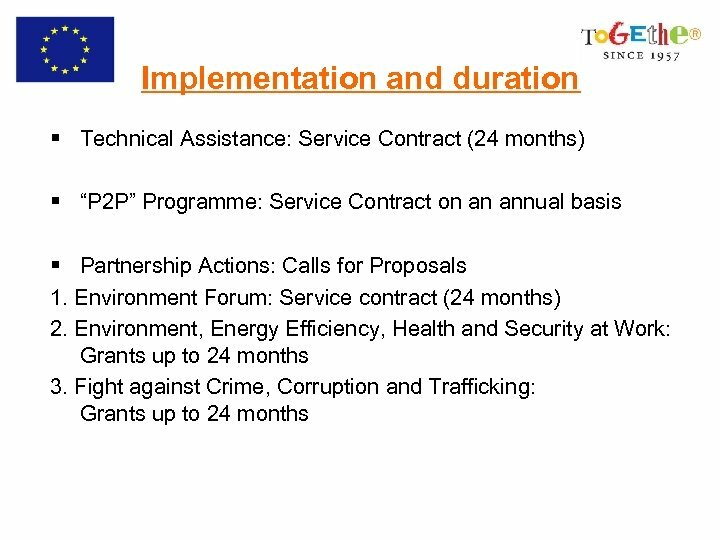 It is expected that contracts will be signed in early 2009. 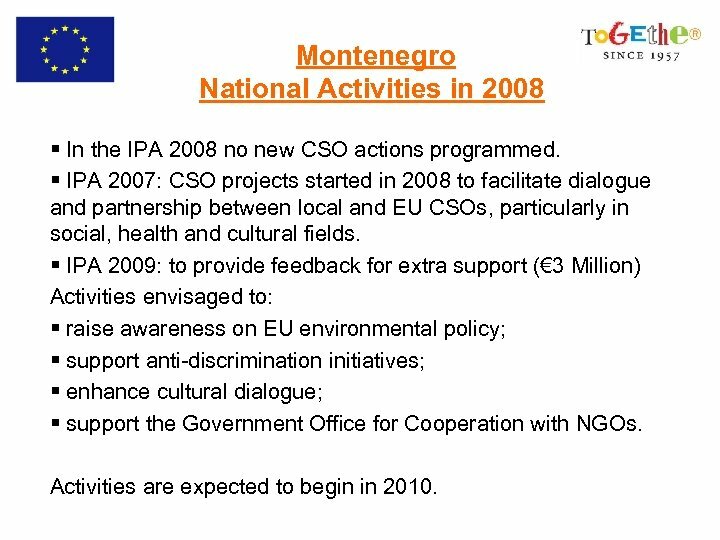 Montenegro National Activities in 2008 § In the IPA 2008 no new CSO actions programmed. 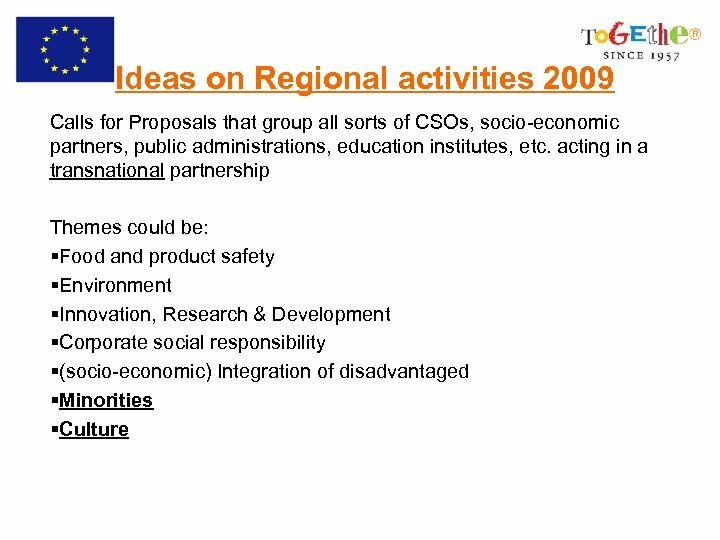 § IPA 2007: CSO projects started in 2008 to facilitate dialogue and partnership between local and EU CSOs, particularly in social, health and cultural fields. 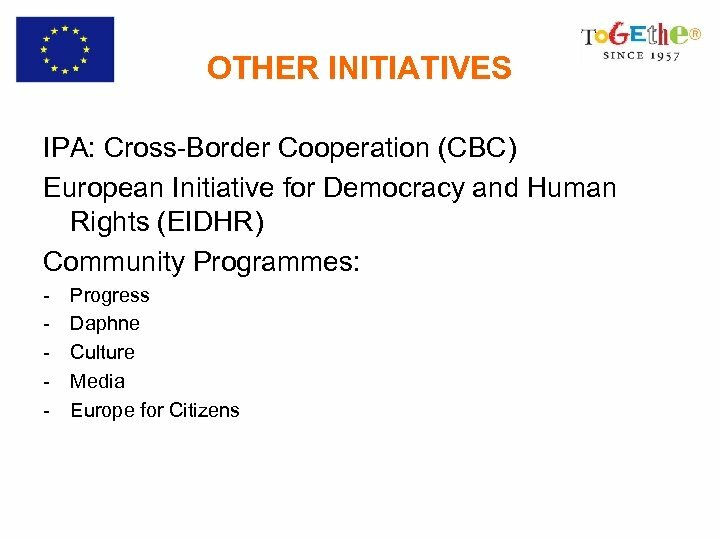 § IPA 2009: to provide feedback for extra support (€ 3 Million) Activities envisaged to: § raise awareness on EU environmental policy; § support anti-discrimination initiatives; § enhance cultural dialogue; § support the Government Office for Cooperation with NGOs. Activities are expected to begin in 2010. 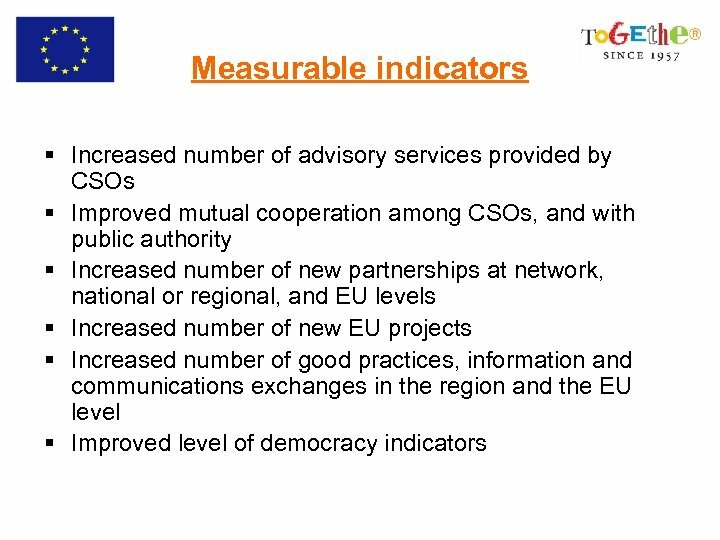 Serbia National Activities in 2008 Under the IPA 2008 € 2 Million for CSOs Aim to strengthen dialogue and partnership between the Serbian government and civil society as well as to promote and reinforce the capacity of CSOs. All projects ready for tendering in the 1 st quarter of 2009. 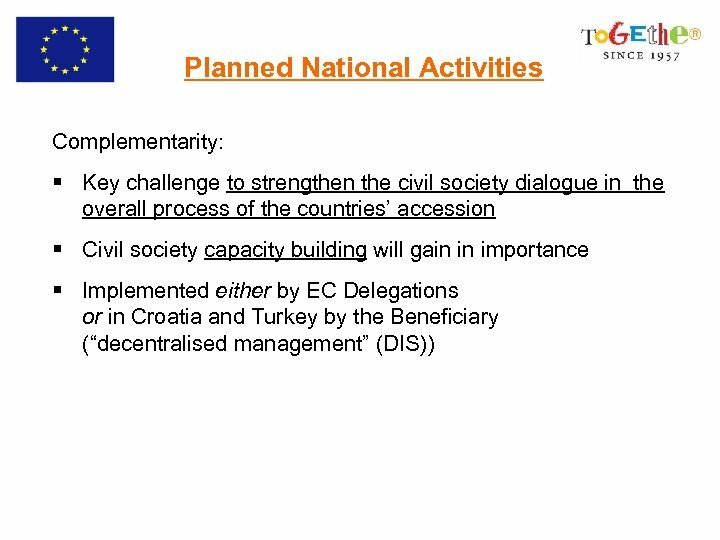 Turkey National Activities in 2008 In addition to the current implementation of Civil Society Dialogue programme, the IPA 2008– 2010 will offer a further opportunity for strengthening dialogue (€ 30 ‑ 45 Million) and will: § facilitate domestic development of civil society and its involvement in the shaping public policies; § reinforce social dialogue and trade union rights; § promote cultural diversity and minority rights; and § support social inclusion of vulnerable persons, including Roma. 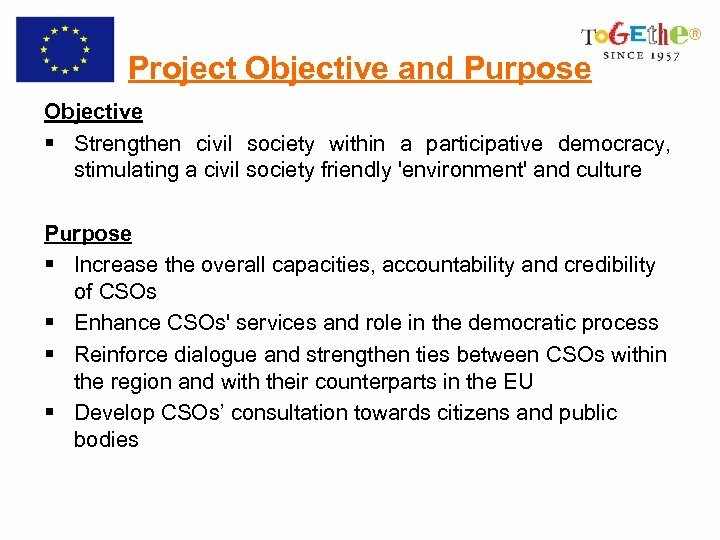 In 2009 and 2010, projects will be launched to reinforce the democratic participation of civil society.